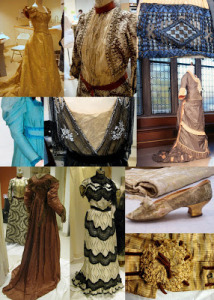 The Vassar College Costume Collection was awarded an NEH Preservation Assistance Grant for Smaller Institutions in the spring of 2010, to host a Historic Costume Preservation Workshop. I was the Principal Investigator for this grant. I supervised labs for 14 student interns to work with 19th and 20th century clothing artifacts through all stages of documentation, stabilization, research, and mounting, resulting in a formal exhibition with a digital component. The project also provided workshops from three leading professionals in the field: Jonathan Scheer (Conservator), Jessa Krick (Costume Historian), and Colleen Callahan (Costume Conservator and Historian). Students gained valuable experience with handling and storing historic artifacts, cataloging them in a Filemaker database, writing condition reports, and even working on stabilization treatment of select objects so they could be mounted, displayed, and photographed. These skills have been passed down from student to student in years since. The project culminated in a gallery exhibition, “A Glimpse into Vassar’s (Secret) Closet,” which lives on in a digital exhibition at http://vcomeka.com/vccc/exhibits/show/glimpse/intro.